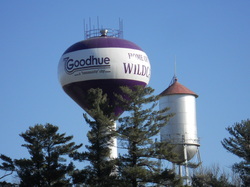 Goodhue is where small town and agriculture people have joined forces to create a life centered around families working together, a community of faith and friends and a rich history of lives growing together. As progress and growth move us forward, it is important to our community to preserve the memories of the vibrant life of people helping each other. We welcome everyone to visit our history museum and experience how our community blends lifestyles together. Museum is completely handicapped accessible. The museum will reopen for the season on June 2nd through August 2019, Sunday's and Thursday's from 1:00 - 4:00 p.m.
to open our doors ​for you or your group.